Summary: Meatballs usually call for three types of meat: beef, pork and veal. If your grocery lists are similar to mine in rarely containing ground pork and veal and yet you enjoy eating spaghetti meatball on busy weeknights, then you may find this recipe helpful. 1 teaspoon dry parsley. It can be substituted with fresh parsley, basil or oregano. Place a baking rack over a baking sheet lined with aluminium foil. Lightly spray the rack. In a large bowl, combine the panko and cheese with the milk. Set the mixture aside for some minutes until the panko and cheese have soaked in the milk. Add the ground beef, egg, onion and garlic powder, basil and oregano to the milk mixture. Form the meatball into 1½ inch balls and place them on the baking rack. Cook at 450ºF, middle position, for 30 minutes. Let the meatball cool for about 15 minutes. Add the meatballs to the tomato sauce and cook on low heat for about 5 minutes. Cook the spaghetti as instructed on the box. Serve the meatballs with the spaghetti. Sprinkle with additional parmigiano reggiano cheese. 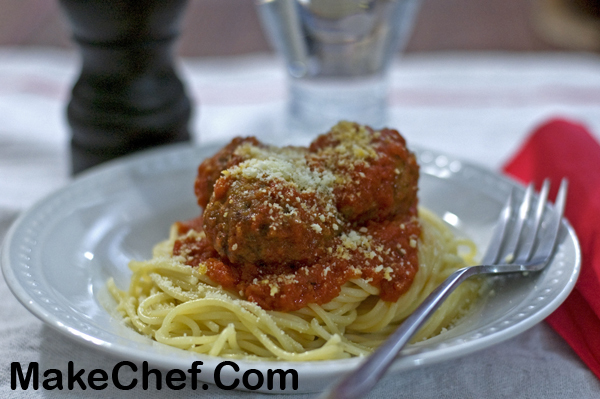 This entry was posted in Beef, Recipe, Rice, Pasta and Noodle and tagged meatball, spaghetti.